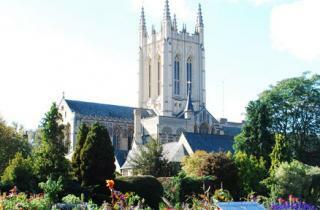 Lent starts on Wednesday 10 February and St Edmundsbury Cathedral in Bury St Edmunds will mark this season with two series of talks which are open to all. On Tuesdays, the Cathedral is relaunching its popular Tuesday Evenings at the Cathedral series of discussions and debates addressing issues at the interface of the church and wider society. During Lent the programme, which starts on Tuesday 16 February, focuses on Religion and Violence. These lectures are from 7.30 pm to 9 pm in the Cathedral Lecture Room. Refreshments are served from 7 pm. All are welcome and admission is free, with a retiring offering. In addition another series of talks takes place on Friday lunchtimes at 1 pm in the Edmund Chapel in the Cathedral. The theme for these 30 minute talks is Healing. Admission is free. These series run until 15 and 18 March respectively.